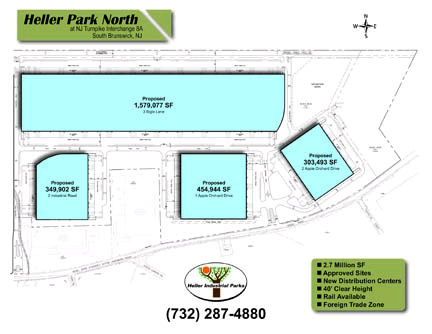 Real Estate Development - Heller Industrial Parks, Inc.
HELLER PARK NORTH, South Brunswick, NJ With a land-bank of over 170 acres, Heller Industrial Parks is ready to build your new distribution center in close-to-market locations that make other developers green with envy. In central NJ, where the value of vacant land has shot up due to a shortage in buildable lots, Heller still has 134 acres at New Jersey Turnpike Exit 8A. Located at the heart of distribution alley, our virgin land awaits a customer who demands nothing but the best in location, quality and price for new construction. We build our distribution centers ourselves, using our own management, engineering and supervision. Our standards for new construction include 40' clear ceiling height, 8 1/2" floors, ESFR sprinkler system, energy-efficient lighting, 52" dock height, mechanical dock levelers, dock lights, 190' loading courts, and 60' concrete aprons. Available lot sizes are 4.5 to 134 acres. Many lots are rail served, and every lot is to be served with existing city sewer, water, and available high speed cable or fiber optic. Call for more information, or visit Heller Park North web site. Continues on a rapid pace at Heller's newest project, a 285,362 SF industrial distribution center on Industrial Road in South Brunswick, NJ. 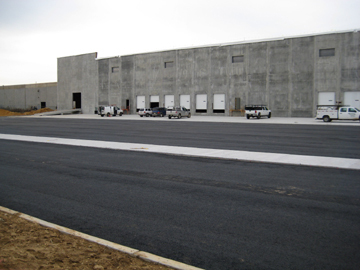 The first warehouse to be built to accommodate 40 top-of-storage in South Brunswick also boasts 83 trailer parking and a pump-less ESFR sprinkler system. Construction is scheduled to be complete by March 31, 2016. The building was leased in its entirety to All Ways, a Los Angeles-based third-party logistics firm. Read the Story. HIP Solar was created in order to deliver clean energy to select buildings in its portfolio. Many tenants benefit from the lower cost and the environmental responsibility factor that clean energy delivers! Call your Heller Fellers (732-287-4880) for more information.